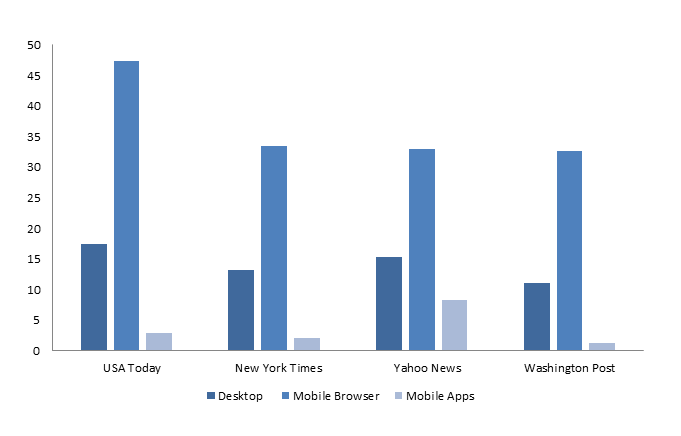 Mobile versus Desktop – What’s the Future of News? According to the study, far fewer people download news apps when compared to the large numbers accessing sites via their desktop computers or mobile browsers. AND, while mobile browsers win for reach, desktop computers win for greater engagement. Source: comScore, Media Metrix Data for March 2016. Audience reach is the estimated average number of individuals (in thousands) visiting any content of a website per day in the report month. The study, which is full of data, explains shows how little we know of the growing use of mobile. Apparently, users scroll more than read and engage with news sites when they’re on their phones. And, beyond raising awareness of where news organizations should invest, this study raises the bar on a far more important issue – how we as a society stay informed and make decisions. Previous Previous post: Buy or Build?